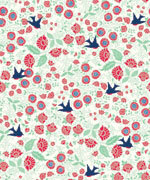 A beautiful new range of fabrics by Anna Griffin. They are modern in design but the colours are very fashionable with the red, white and blue theme running through them. Price is for a fat quarter and if you want half a metre just put 2 in the shopping basket, 4 for a metre and so on. Happy Shopping!